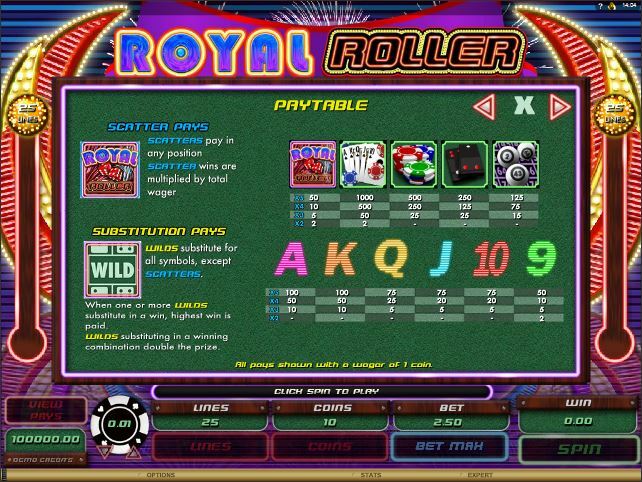 In Royal Roller, Microgaming’s decision was to create a game with a gambling related theme, with poker cards, roulette and other games that you would find inside such an establishment in Las Vegas. You can’t really shake the feeling that it’s a Las Vegas themed game, not with all those lights that are present behind the game area. The design wouldn’t be something you would be impressed with though, it’s just not modern enough for that. 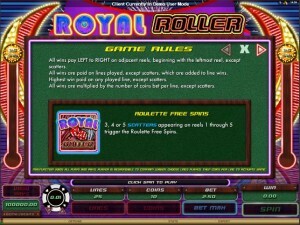 5 reels exist in Royal Roller, 25 paylines total on them. 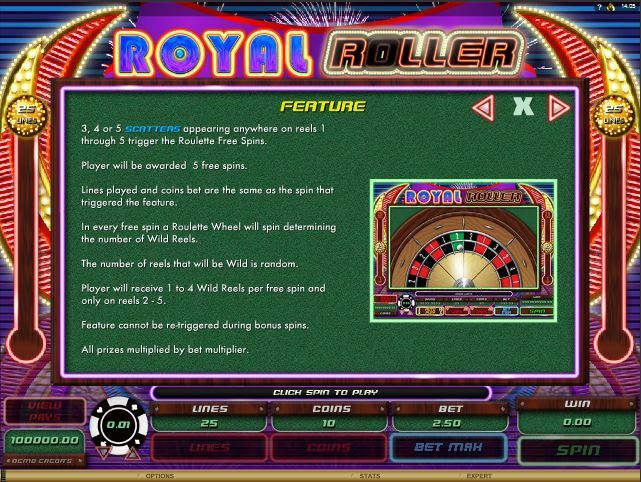 As you play the game, you will discover Roulette free spins, scatter symbols, wild reels and regular wilds. The jackpot is worth at best $5,000. 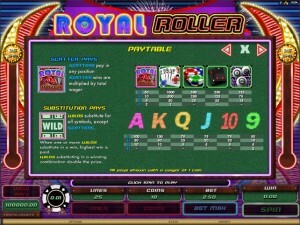 The game relies on features like the wild symbol, a multiplier, scatters and Roulette free spins. The wild symbol’s image is that of a WILD Logo, using a light green font and the dice which are barely visible around it. This symbol is only used as a substitute in newly formed combinations, which means that if it appears where it’s needed it can take the place of another symbol. The payline needs to have matching icons on it already, the wild providing only the missing element. The presence of a wild in a combo will bring with it a multiplier which doubles the value of that win. The other major symbol is the Royal Roller Logo, the scatter symbol. You can count on it bringing you prizes of 2x to 50x the value of the bet, as long as you land a minimum of two such symbols in random positions. The slot’s free spins require the presence of 3 or more scatter symbols with the game logo on them. You are given the prizes I mentioned above, but you also receive the free spins feature. 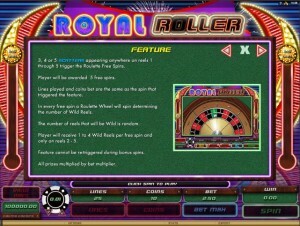 You get 5 spins for free only though, but with some very cool wild features attached. Free spins can’t be retriggered, they’re just too valuable and the developers unfortunately decided not to include this particular possibility. 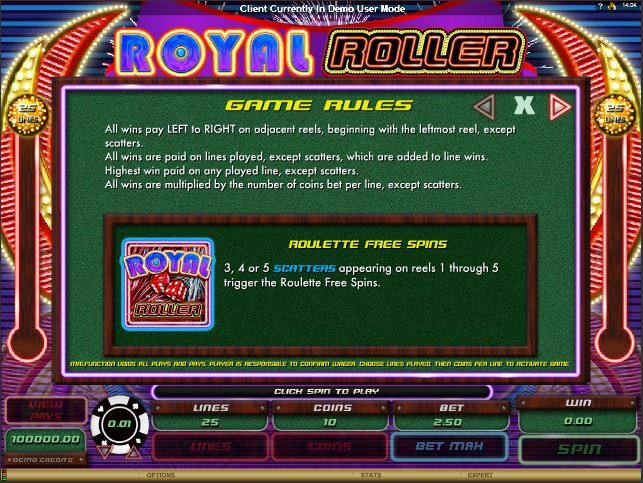 At the beginning of each of the 5 free spins, you get a roulette wheel helping you by determining how many wild reels you can take advantage of that round. Just how many wild reels you get will be decided at random, but at most you can get four wild reels, from the 2nd to the 5th range. You can’t get a wild reel on the 1st column. When a bet is made, there are three things to consider. The number of lines that are activated is one of them, with up to 25 available. Another would be the number of coins, with a maximum of 10 used on each line. Finally, you choose the coin value, which reaches $0.50. Add it all up, and you get a line bet of up to $5, with a total of $125. The slot’s most impressive reward comes from the Poker Cards, which give you 1,000x, or 10,000 coins. Their value would be $5,000. The Las Vegas inspiration that seems to have been important when this game was designed has brought its players a lot of pretty lights in the background, along with neon like poker cards, but the implementation isn’t that great. 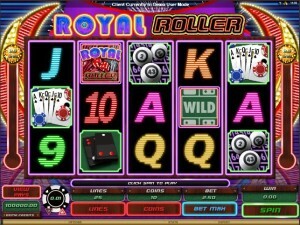 The design resembles an older style of slot machine, not a modern title where you’re impressed with its graphics. Symbols: Royal Roller Logo (scatter, 50x total bet), Wild Dice (wild), Poker Cards (1,000x), Poker Chips (500x), Dice (250x), Bingo Balls (125x), Ace (100x), King (100x), Queen (75x), Jack (75x), 10 (75x) and 9 (50x). While you will not get a great experience from this game, not with that design, the features and the theme might still be attractive enough for someone that loves gambling. This Royal Roller slot is offered by all online casinos with Microgaming software, playable either in practice or in real money mode.